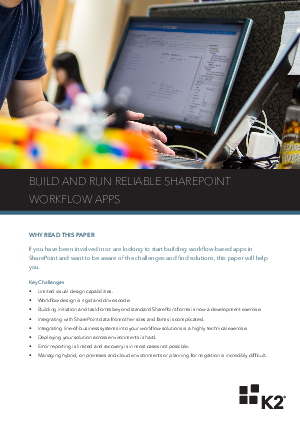 If you have been involved in or are looking to start building workflow-based apps in SharePoint and want to be aware of the challenges and find solutions, this paper will help you. • Limited visual design capabilities. • Workflow design is rigid and drives code. • Building initiation and task forms beyond standard SharePoint forms is now a development exercise. • Integrating with SharePoint data from other sites and farms is complicated. • Integrating line-of-business systems into your workflow solutions is a highly technical exercise. • Deploying your solution across environments is hard. • Error reporting is limited and recovery is in most cases not possible. • Managing hybrid, on premises and cloud environments or planning for migration is incredibly difficult. BUILD AND RUN RELIABLE SHAREPOINT WORKFLOW APPS.